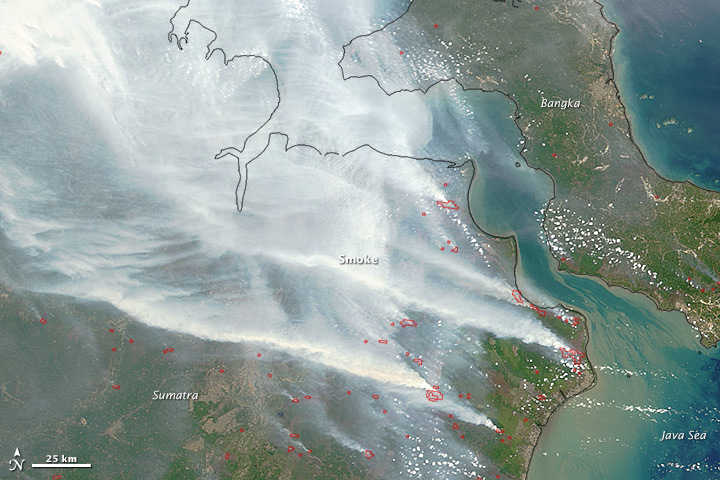 Fires in Indonesia are not like most other fires. They are extremely difficult to extinguish. They smolder under the surface for long periods, often for months. Usually, firefighters can only put them out with the help of downpours during the rainy season. And they release far more smoke and air pollution than most other types of fires. The root cause is large deposits of peat—a soil-like mixture of partly decayed plant material formed in wetlands—lining the coasts of Borneo and Sumatra. 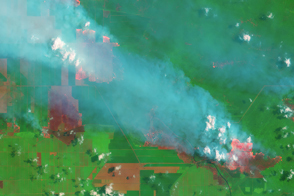 Peat fires start to burn in Indonesia every year because farmers engage in “slash and burn agriculture,” a technique that involves frequent burning of rainforest to clear the way for crops or grazing animals. 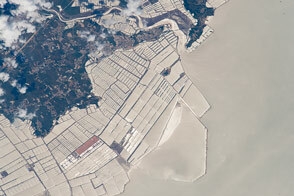 In Indonesia, the intent is often to make room for new plantings of oil palm and acacia pulp. “Most burning starts on idle, already-cleared peatlands and escapes underground into an endless source of fuel,” explained David Gaveau of the Center for International Forestry Research. 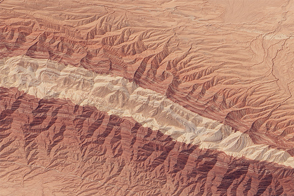 As seen in this September 24 image from the Moderate Resolution Imaging Spectroradiometer (MODIS) on NASA’s Terra satellite, 2015 is no exception. Red outlines indicate hot spots where the sensor detected unusually warm surface temperatures associated with fires. 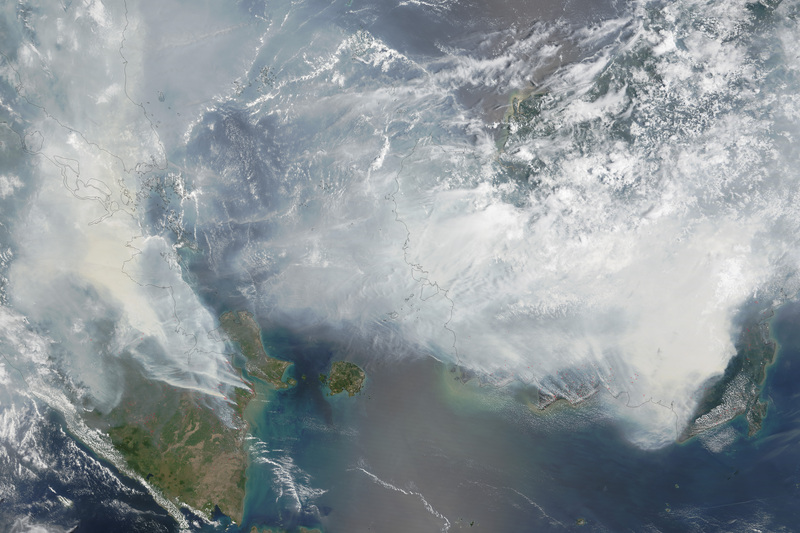 Thick gray smoke hovers over both islands and has triggered air quality alerts and health warnings in Indonesia and neighboring countries. Visibility has plummeted. Scientists monitoring the fires are concerned that the problem will get worse before it gets better. That’s because strong El Niños, like the one currently brewing in the Pacific, lengthen the dry season and reduce the amount of rainfall. During a strong El Niño in 1997, the lack of rain allowed fires to burn out of control on a wide scale, releasing record levels of air pollution and greenhouse gases. 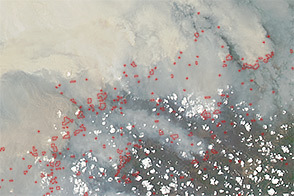 Along with colleagues at NASA and the University of California, Irvine, van der Werf has developed a technique to estimate the amount of trace gases and airborne particles that fires emit—many of them pollutants—based on satellite observations of fires and vegetation cover. The project, known as the Global Fire Emissions Database (GFED), produces both regional and global estimates of fire emissions based on data from 1997 to the present. According to the GFED analysis, the 2015 Indonesia fires have released greenhouse gases equivalent to about 600 million tons through September 22, a number that rivals carbon dioxide a year of carbon emissions from Germany. 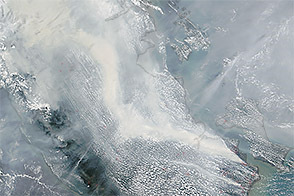 NASA image by Adam Voiland (NASA Earth Observatory) and Jeff Schmaltz (LANCE MODIS Rapid Response). Caption by Adam Voiland. As El Niño intensifies, peat deposits are making seasonal fires in Sumatra and Borneo unusually difficult to control. The Conversation (2015, June 16) Indonesia at risk from huge fires because of El Nino. Accessed September 24, 2015. Field, R. (2009, February 22) Human amplification of drought-induced biomass burning in Indonesia since 1960. Nature Geoscience, 6112. Gaveau, D. (2014, May 7) Major atmospheric emissions from peat fires in Southeast Asia during non-drought years: evidence from the 2013 Sumatran fires. 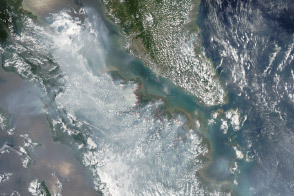 Scientific Reports, 6112.
International Business Times (2015, September 24) Singapore Blanketed In Haze Blown In From Indonesia, Conditions Expected To Worsen. Accessed September 24, 2015. Turetsky et al, (2015) Global vulnerability of peatlands to fire and carbon loss. Nature Geoscience, 2, 185-189. Straits Times (2015, September 24) Indonesia declares emergency in haze-hit province. Accessed September 24, 2015. Wildfire Magazine (2014, May 7) The long slow burn of smoldering peat mega-fires. Accessed September 24, 2015. World Resources Institute (2014, April 3) Preventing Forest Fires in Indonesia: Focus on Riau Province, Peatland, and Illegal Burning. Accessed September 24, 2015.